Setting up your device varies slightly depending on the platform you are running on. 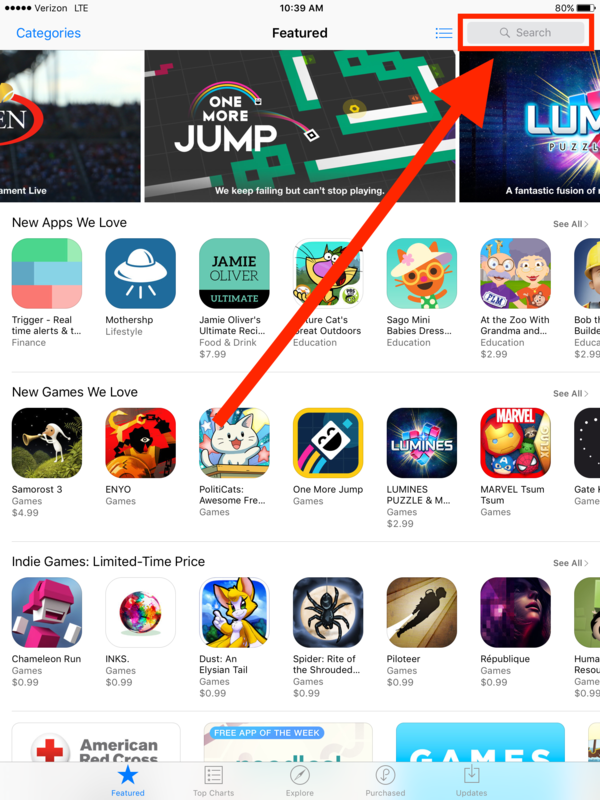 We will walkthrough Apple devices first, however, if you are running on Android devices, please scroll down to that section. For an Apple Device running iOS 8+ you will need an Apple ID setup on the device. You can use the same Apple ID on each device if you prefer, or you can use individual ones. If you do not already have one setup for your device, you can click this link and follow the instructions to set one up. The icon can be moved just about anywhere, so if this has been previously used, you may need to look into folders or on the second page. You can also search on the device by sliding to the left from the main page and typing in the "Search bar" at the top. Type in SWRemote all in one word and select Search. The SWRemote App should show up for you here. If the device has never installed SWRemote before, you will have a button that says Get, which you can select, and then after hitting it you can select Install. 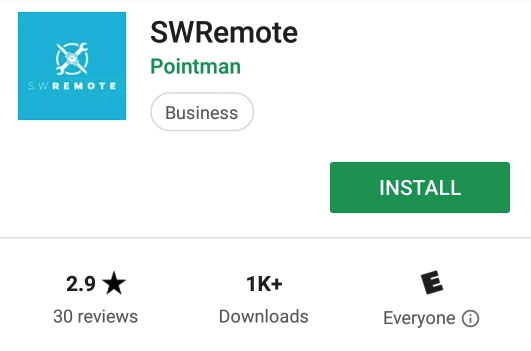 However, if you've installed SWRemote previously on this device, you will see a little Cloud icon, as seen in the image below. Select the Cloud icon to begin the download. Once the download and installation has completed, the icon should update to say Open, you can select this to launch SWRemote. Quickly double click the physical Home button on the bottom of the iPad, which should bring up the Task Manager. Find SWRemote's preview screen, touch and hold it, and slide your finger up to the top until it goes away. Then hit the home button one more time to go back to your main screen. More detailed instructions are found by clicking HERE. Open up Safari and in the address bar enter the following: help.swremote.com and go to this address. 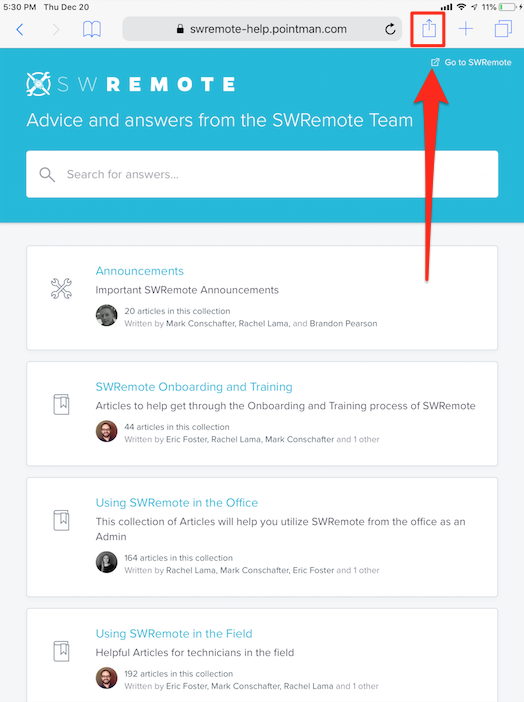 This is the SWRemote Help Site, that your techs will be able to use to reference issues quickly on the fly. We're going to add this as a bookmark to the home screen to improve the ease of access for them. Click on the Share button on the top right of Safari (see the image below). Inside the list of options, click the Plus sign that says Add to Home Screen and then choose a name for the shortcut, something like "Help for SWRemote" or "SWRemote help Search" may be a good idea. Then click Add. This should show on on the home page where this is added, again for quick access for your techs in the field. For an Android device, you will need a Google account setup on the device. You should have set this up when activating the device. You are able to use the same Google Account on multiple devices, but you can also setup individual accounts. If you need to setup an additional Google Account, you can do that follow the steps in this link. Find the Google PlayStore icon on your device. This is usually stored by default in a folder labeled Google, but if the device has been used previously it could be moved to another screen. Once inside the PlayStore, type in SWRemote (all one word) in the Search bar in the top of the screen. Once this has completed installing, you will now see two boxes, a white one that says Uninstall and a green one that says Open. Select Open to go into the SWRemote App. 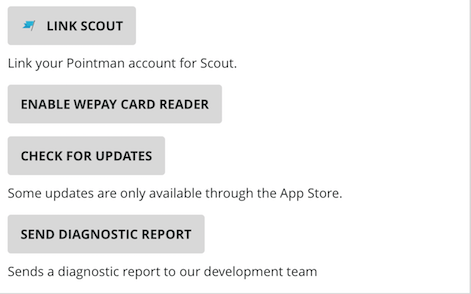 This is the SWRemote Help Site, that your techs will be able to use to reference issues quickly on the fly. We're going to add this as a bookmark to the home screen to improve the ease of access for them. Click on the button with the three vertical dots on the top right of Chrome (see the image below). Step 2: Setting up the Users, requires SuccessWare21 access to both the User Manager and the Employee Manager. Depending on the situation, you may need access to the Company Settings as well to change the Minimum Username Length (more on this later). If you do not have access to this inside SuccessWare21 you will need to work with someone who has these permissions. 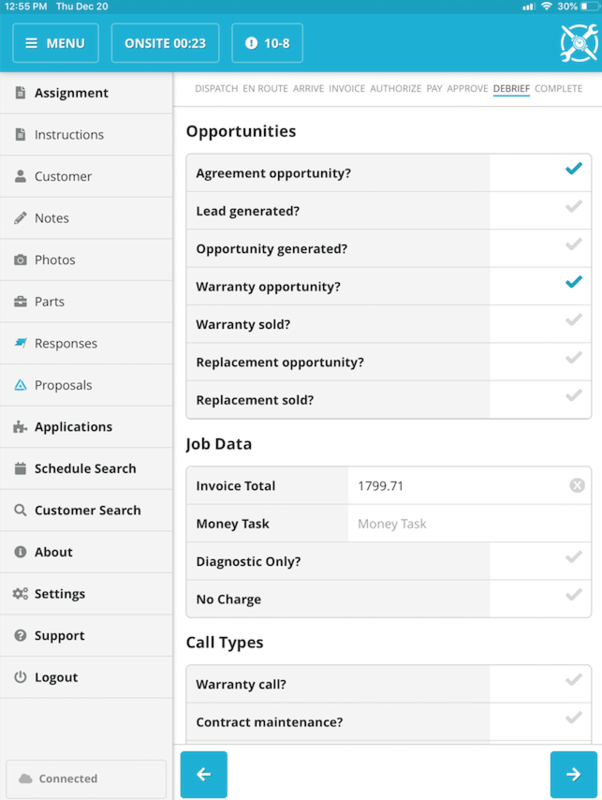 We will also setup a Vehicle in the Inventory Manager so your technician can submit material requisitions. If you do not submit material requisition, you can skip the section on adding a vehicle. 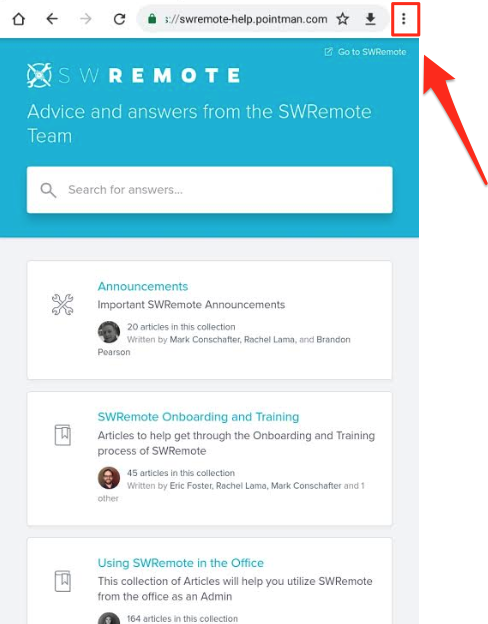 *Note* If this is your first user you are setting up for SWRemote, please follow the steps here to create the Remote Tech User groups. This will bring up the Add User screen. *Caution* Do not change the username. It is being copied from the Employee Code and it must match this exactly, even if it is random. If the Username does not match the Employee code, the Tech will never be able to login. Next select the User Group dropdown and select the appropriate RemoteTech User group. RemoteTech has basic privileges. If they will be working on call after hours and adding calls from the device, set them to RemoteTechOnCall. 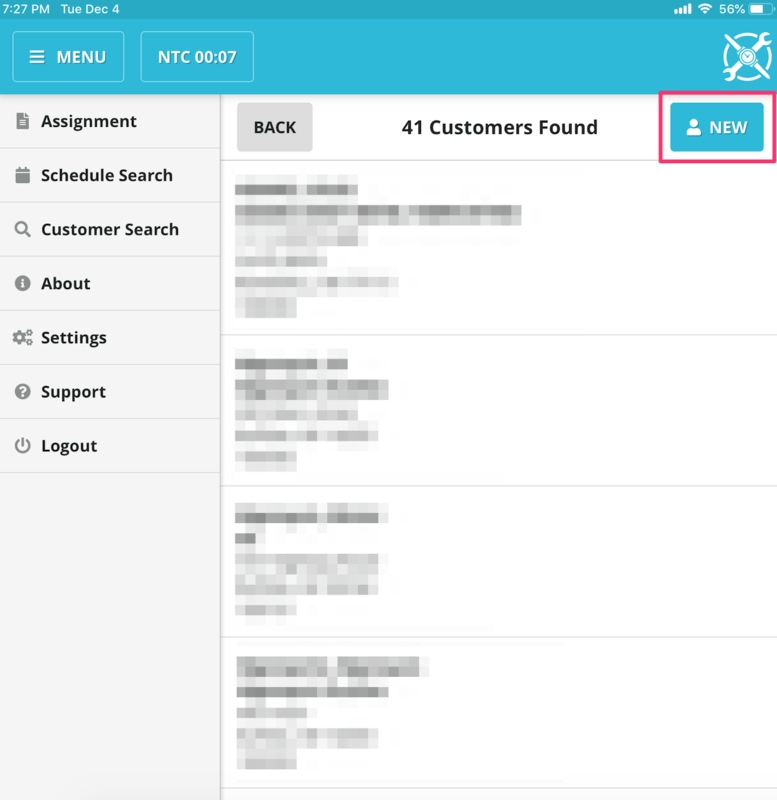 If they are a field manager and need to add calls from the Device and search the entire schedule, set them to RemoteTechManager. Click Save. *Note* If you receive an error stating that "The Username must be greater than x characters," you will need to cancel the changes and follow the steps here to adjust the minimum username length and then start over. In order to get the initial password, you will need to click the Reset Password button inside the User. This will look like a blue hyper link (see image below). Follow the prompts after you do this, and the password should be on the third box that pops up. You DO NOT need to change this password unless you have them set to expire, but if you wish to update the password this can be done from the SuccessWare21 login screen, as described in the article here. Make sure you make note of both this password, and if you change it that one, as well as the tech's username. *Note* SWRemote does not see, change, or have any control over these passwords. They are all controlled through the method you just used, and our Support Team cannot recover the password your technicians have or reset it. *Note* This is only required if your technicians will be submitting Material Requisitions to SuccessWare21. You will also need access to the SWRemote Administrative Website in order to push your update through. 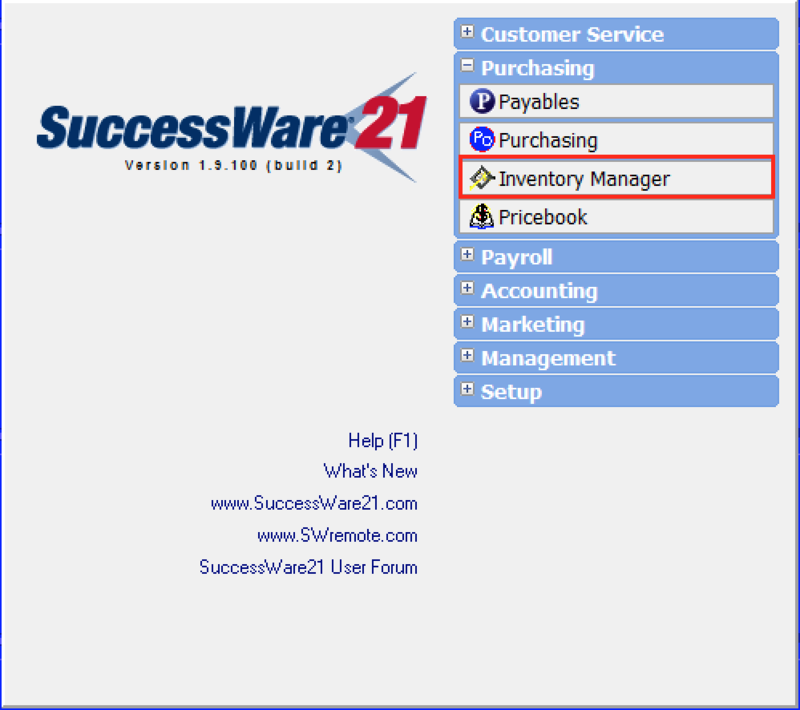 Select the Red 21 at the left most part of your toolbar, then Purchasing, then Inventory Manager. 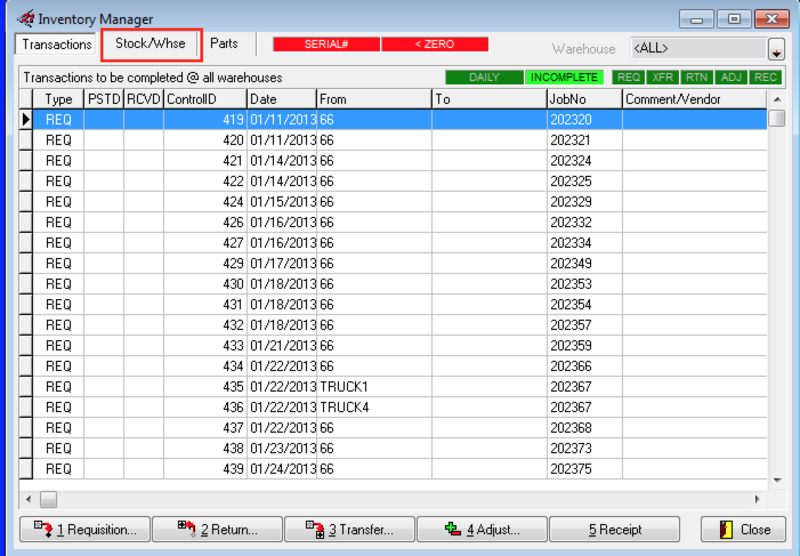 This should open up the New Warehouse screen, which has three important fields to be used with SWRemote for Requisitions. 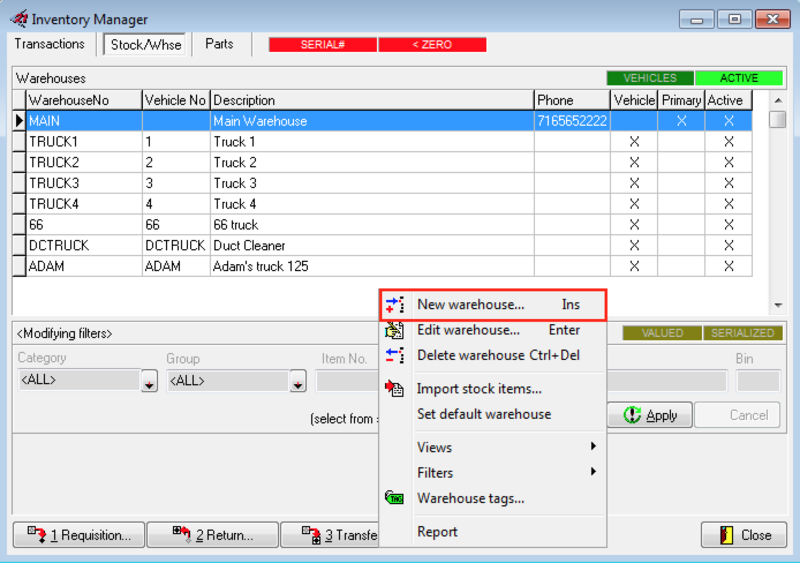 You will need to add a unique Warehouse No then select the Vehicle check box. Upon selecting the Vehicle check box, you should see the Vehicle No field become available. This is most important part, as this field must be filled in, and unique with all of the other Vehicles. 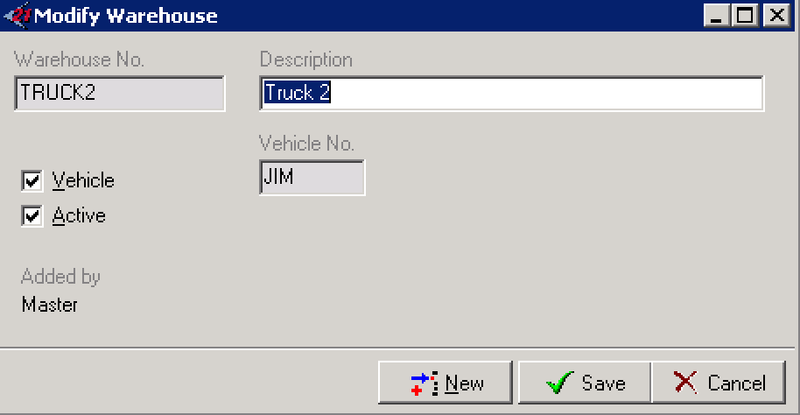 *Note* If you do not fill in the Vehicle No, or do not make it unique, the vehicle will not show up inside SWRemote. The Description field, is the field that will display when your tech's log into SWRemote, so you will want to make this as clear as possible. The SWRemote team recommends something simple like "Bill's Truck" for example. Once you've added the Description, press the Save button. Click on the link here to open up the SWRemote Admin Site and log in with your SWRemote Administrative credentials. If you don't have a login you will need to contact the person in your office who has access or contact the SWRemote team. Select the Master Accounts tab from the left menu. 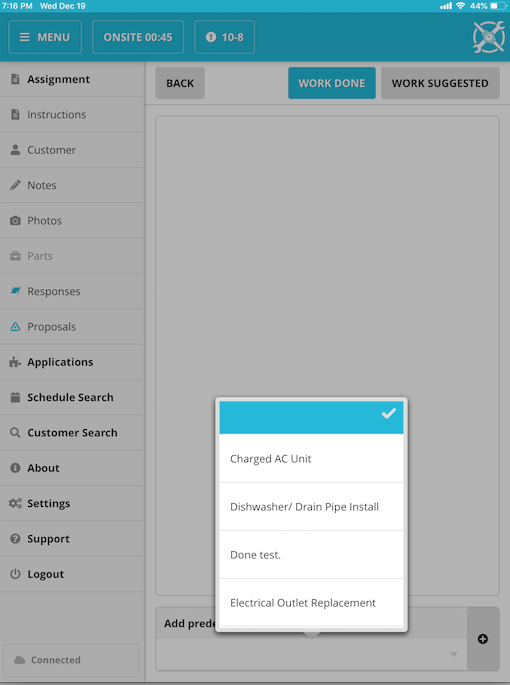 Inside this page scroll down below the PayFlow Pro Settings and select the Orange Update button. This will pop up a menu while it runs. This could take 5 - 10 minutes, depending on the size of your pricebook and how many databases you have inside SuccessWare21. It should report that it's completed when it's done. 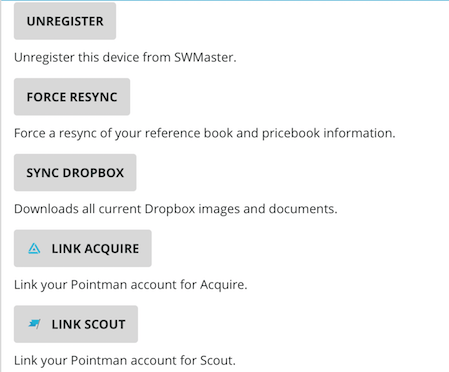 In Step 3, we will assign your device to your SWRemote Account and get your technician logged into SWRemote. 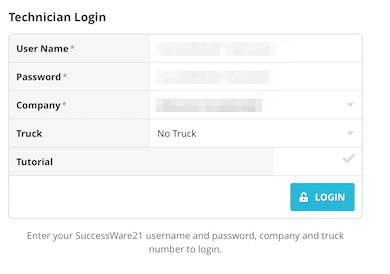 In order to do this we will need your SWRemote Administrative Account, the technician's Username and Password that you setup earlier, and if you're doing Material Requisitions, the Vehicle you setup. Open up SWRemote by clicking the SWRemote icon on your device. This should take you to the Register Device Screen. There are three fields you need to fill in on this screen. 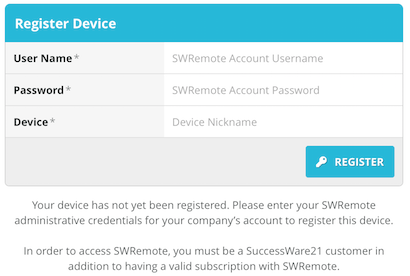 The Username will be your companies SWRemote Administrative Username, the same one you use to login to the SWRemote Administrative Website (admin.swremote.com), while the Password will the be corresponding password. The Device Name field, is a Nickname you will be creating for this device. SWRemote is not looking to validate this Device Name at all, so you can enter anything inside here. 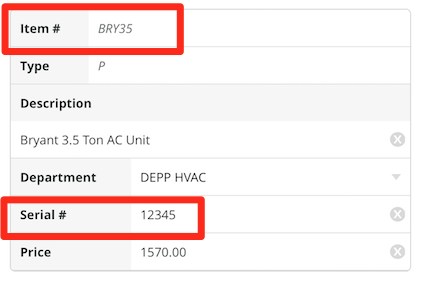 The SWRemote Support Team recommends you name this after the technician using the device, however, we've also seen people number them (Remote 1, iPad 1), or name them after the color of the case (Green, Red). Once you've entered in the information, please press Register. *Note*If you receive an error, you may need to have your password reset or your Username may be incorrect. Please contact the SWRemote Support Team if you have any questions. If you have just registered your device, or have registered the device previously, you should be on the Technician Login screen now. The Technician login screen has several items to make note of. Password. This is the password that we received, or the one that we changed earlier. Company. SWRemote, like SuccessWare21 allows you to log into multiple databases. Make sure your tech is selecting the proper database in this dropdown. The dropdown will "remember" the Company that you select as long as the device can connect to your server. Truck. This is required for Material Requisitions only. Select the Truck we created for your tech earlier in the walkthrough. SWRemote will remember this selection. Tutorial. This will allow you to log into your SuccessWare21 tutorial and run test calls. This will only work if SWRemote has previously connected to your tutorial. We will also need to create a User for this technician in the Tutorial as well so that they can log in. If you need help connecting your tutorial, you can follow the steps here. In Step 4: Walkthrough and Training, we are going to train, or retrain your technician on how to use SWRemote. We're also going to give you a few different options on how you want to do this training. You can download the SWRemote Handbook PDF, which covers everything you can do inside SWRemote. You can even print this out and put it in a folder for your tech as a quick reference guide on the fly. You can follow along inside this Article for a step-by-step guide on using SWRemote. If you wish to train your technician using our helpful walkthrough videos, you can start with Step 1: Viewing the Assignment. Following the guide there you can go step-by-step and watch each video as needed. These are great as both a first introduction to SWRemote and also as a refresher course for techs who are already familiar with using SWRemote. Another great tool to have in training your technicians is the PDF Walkthrough Guide. You can download that by clicking here. The PDF is a powerful tool in training your techs, but if you print this out, you can also provide it as a helpful reference guide for your techs. If you're looking for a walkthrough, but do not want the PDF version or a video, you've come to the right place! 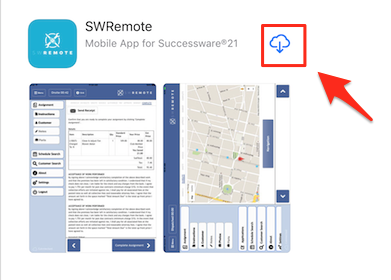 Below, you'll find an entire walkthrough of the SWRemote application. You can continue to follow this, step-by-step, without leaving this document. If you wish to bookmark this for later, or would only like this training document, you can find the same information at this location. Otherwise, continue below for the Walkthrough Document. 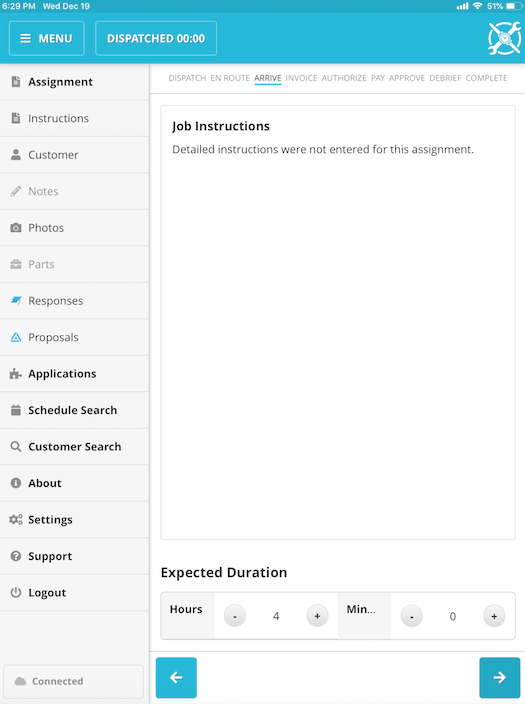 Upon logging in, you will be taken to the Assignment screen and your first job of the day will be shown. If there is more than one job showing, select the first job listed on your screen. Next, you will see the Side Menu (Highlighted in a light blue) on the left side of your screen. This menu will be available to you throughout the entirety of your call. To close this, press the Menu button on the top left of your screen. To re-open this Side Menu, simply press the Menu button again at any time. 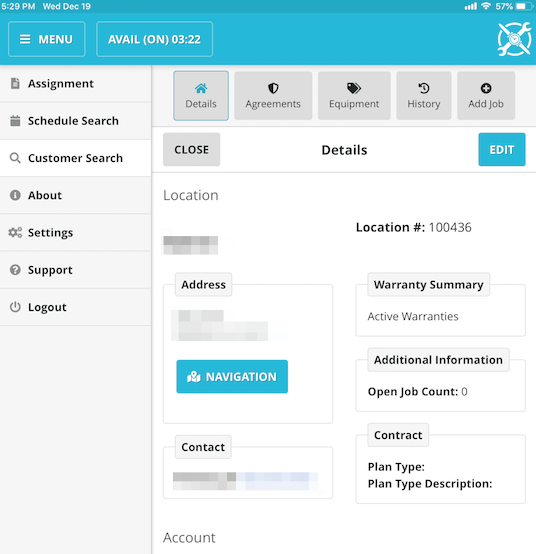 To access Customer information, press the Customer button in the Menu. 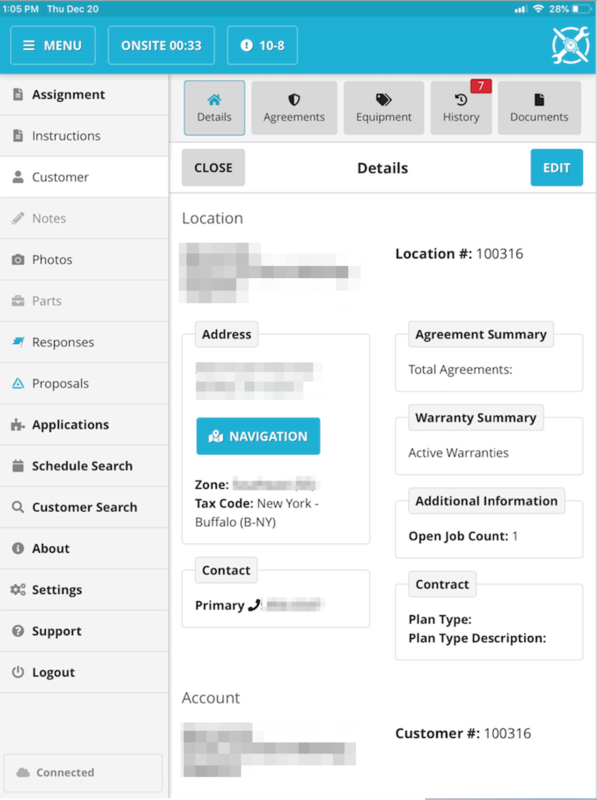 From here you can access customer information, through the buttons at the top of the screen, including location notes, account summary, agreements on file, equipment at the location, and service history. Agreements Tab: Here you will see any active and inactive agreements that this customer currently has or may have had in the past. 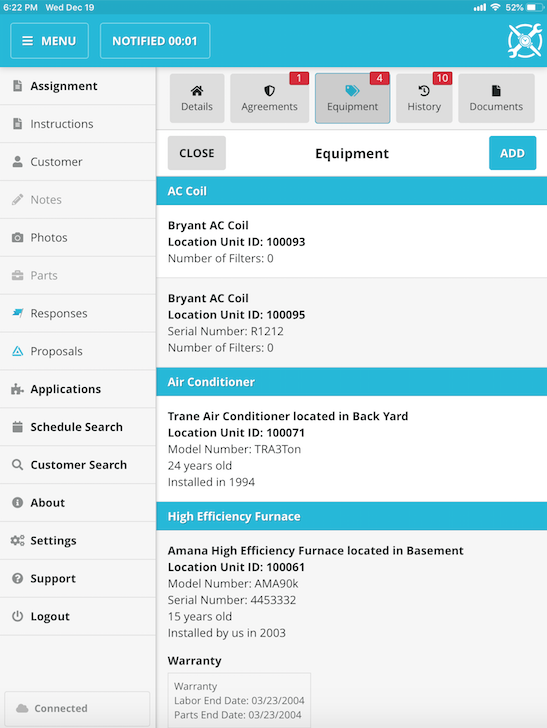 Equipment Tab: Here you will see any equipment along with its information that is or was present at the customer’s location. 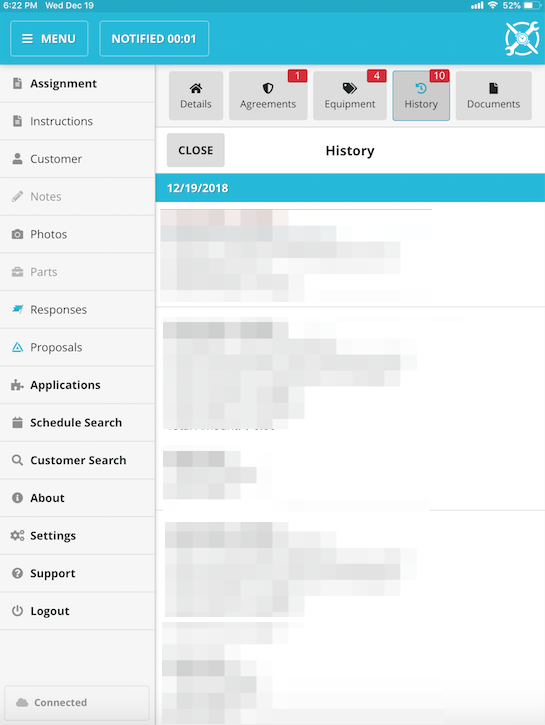 History Tab: Here you can view the last 10 of the customer’s jobs. This will give you information of work done previous to you being onsite. Files: This will display read-only files such as PDFs, Word Documents, etc. These files come from an integrated Dropbox account. Don't have Dropbox integrated yet? Look HERE for setup information! 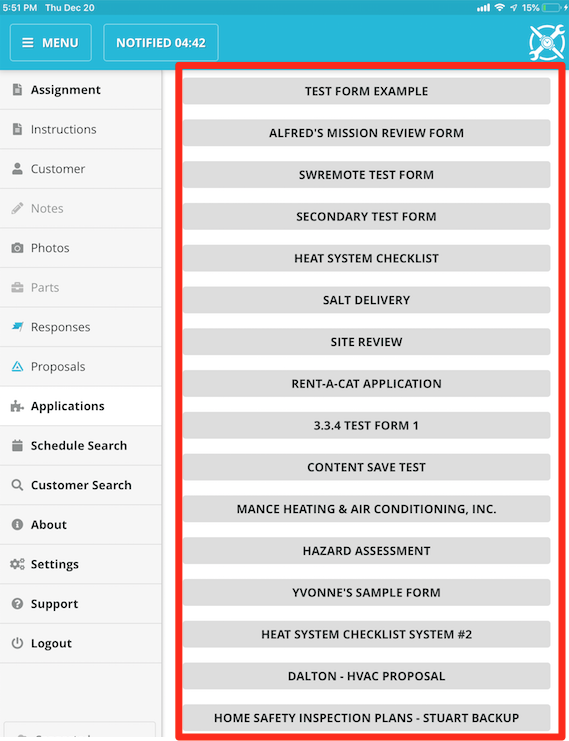 Forms: This will display any saved forms that were filled out by a Technician in the past. As long as there are Forms saved for this Location, they will display on this screen. 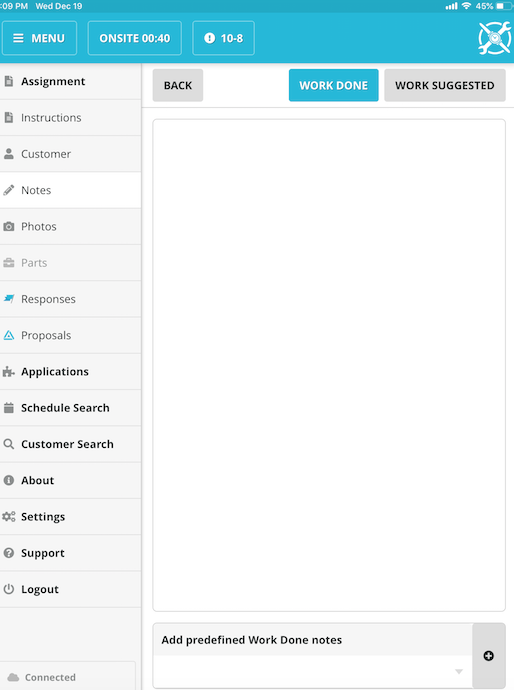 Want to create forms? Look HERE! 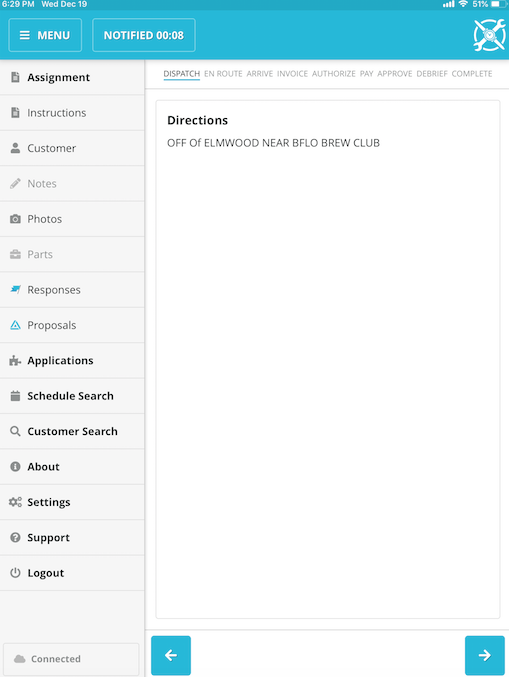 When you are ready to dispatch for this job, read your location directions that are coming directly from SuccessWare21, and press the blue arrow in the bottom right corner to dispatch to the call. 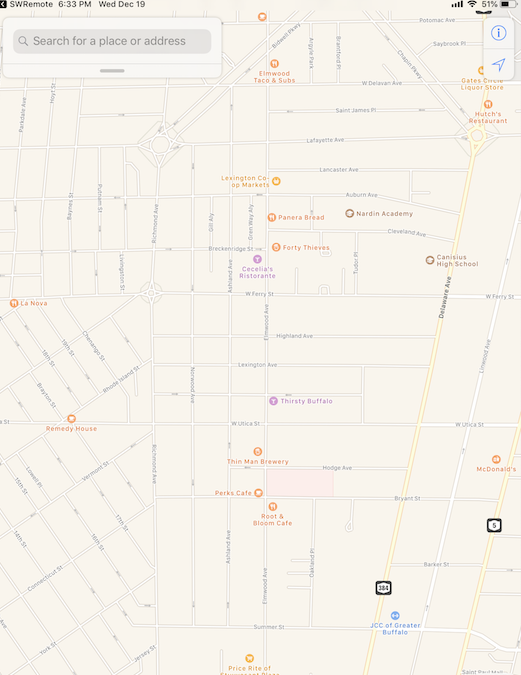 You can also view the overview map of the location by pressing the “Map” button. A map will be shown with the location of the call marked with a red pin point. For turn-by-turn navigation using the native tablet navigation app (Ex. Apple Maps for iPad, and Google Maps for Android) press the blue navigation button in the lower center of the screen. When you arrive at your location, and are ready to begin work, enter your expected work time and press the blue arrow button on the bottom right of the screen to record your start time. Scan, allows you to scan a barcode for an item to be added to an invoice. +Item allows you to search through the pricebook and select items to be added to the invoice. 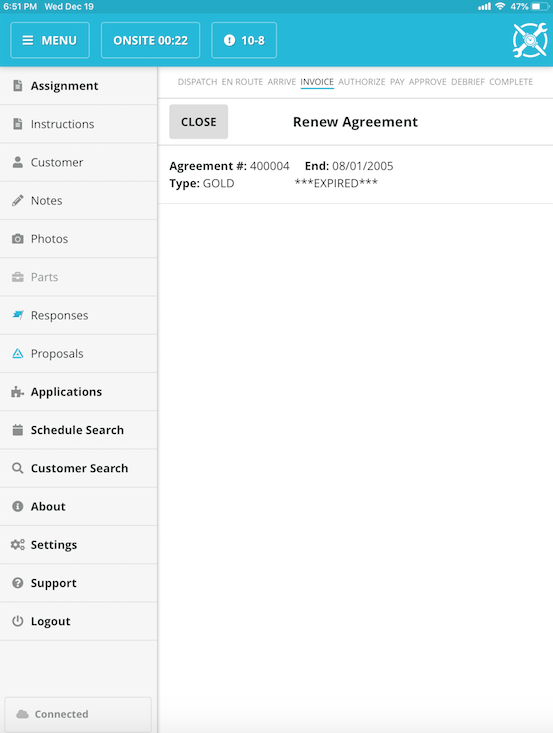 +Agree allows you to create an agreement or renew an existing agreement. +Visit allows you to mark your call as a visit. Discount allows you to add a discount to the invoice. Notes section: there is a Notes button that now becomes available on the side menu. 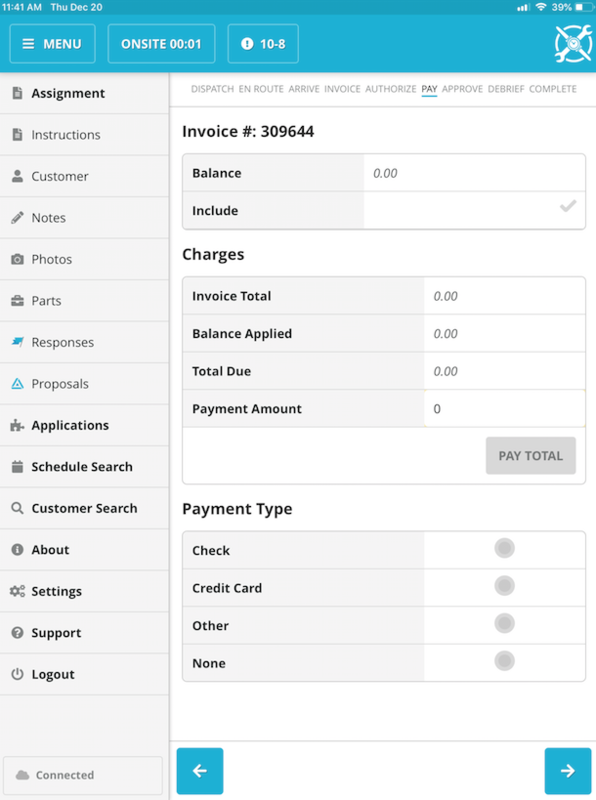 This button allows your techs to add work done and/or work suggested notes to the invoice. 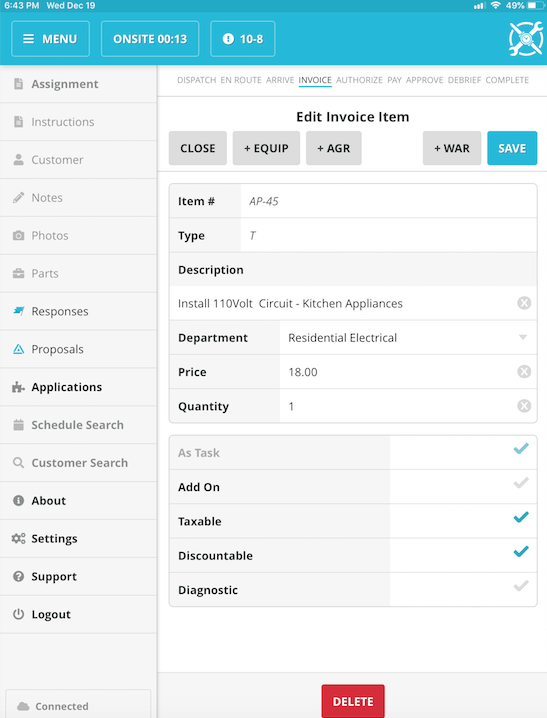 The +Item button allows the tech to add an item to the invoice. 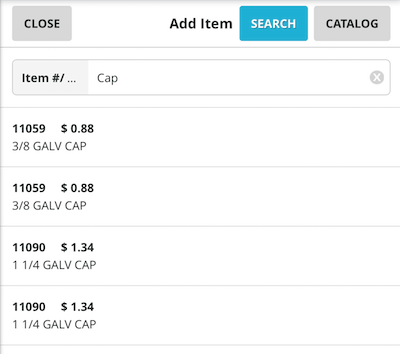 The tech can search by item #, UPC, item description, or they can select the Catalog button and find their item in the pricebook. The full item # or UPC can be entered, or the first letter or number to do a general search. The tech will select an item from the list of choices, and can then adjust the price and/or quantity. 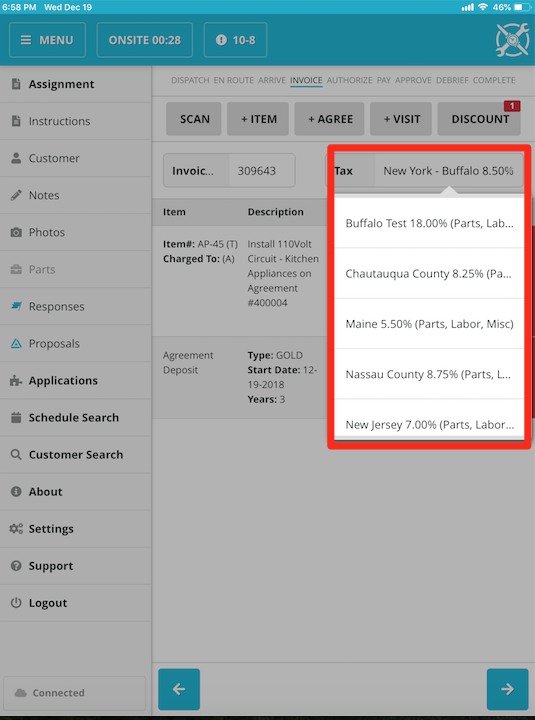 The Taxable and Discountable checkboxes will always be selected by default. Taxable: This will apply the Taxable rate to any item with the Taxable checkbox. Discountable: This will mark the item as Discountable if you are adding a Discount onto the Invoice. The item can also be charged to an Agreement or Warranty by selecting the +Agree, or the +War button, and then selecting the appropriate Agreement or Warranty to be billed to. 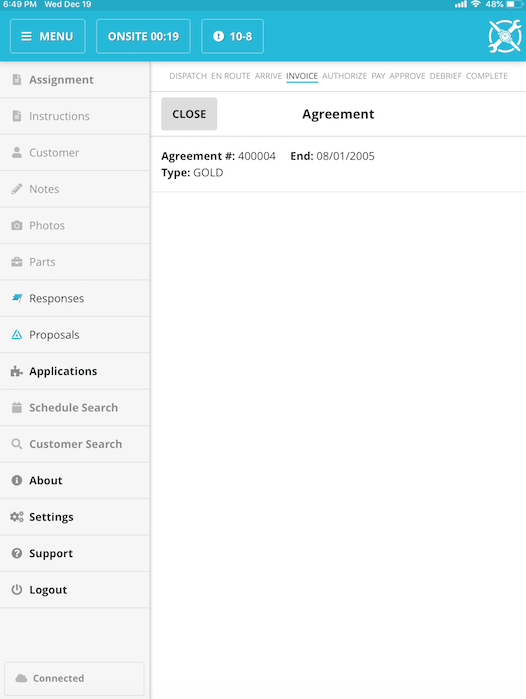 You can add an agreement to the invoice by pressing the +Agree button. 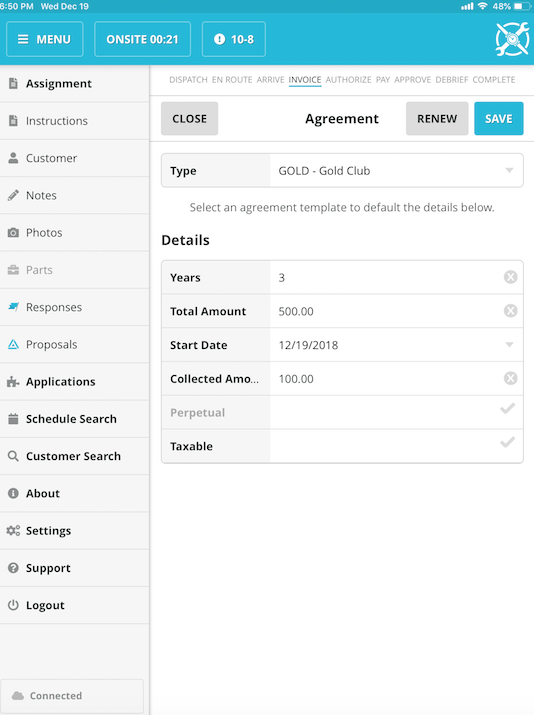 You would then choose an Agreement Template from the drop down menu, and it will auto populate the relevant fields depending upon how the agreement template is setup in SuccessWare21. You can also renew an existing agreement by pressing the Renew Existing button, and then selecting the appropriate existing agreement you would like to renew. 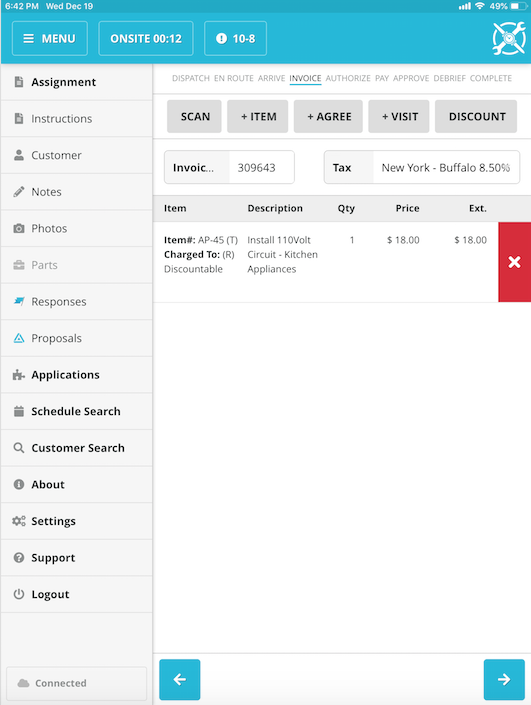 The +Visit button will allow a tech to add a visit to the invoice. 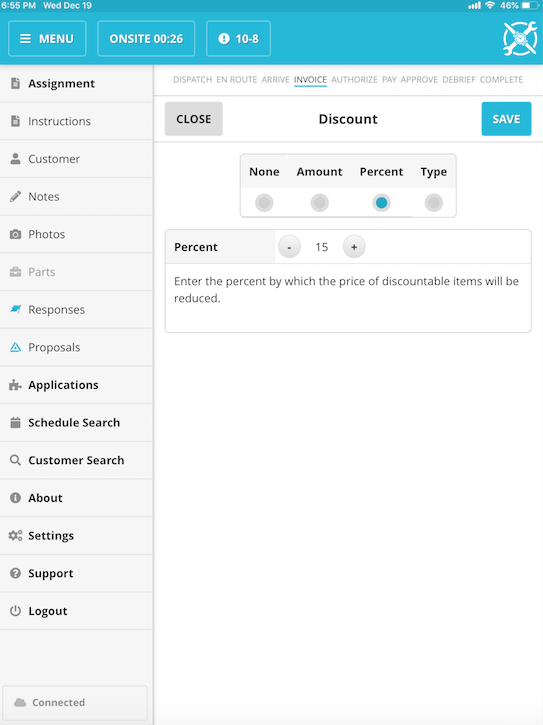 The +Discount button will allow the tech to determine a discount either by amount, percentage, or type. If the Tech needs to remove a discount, they can select none. Here you can select any Tax Codes that your company has setup in the Office. This Tax selection will affect any of the items on the Invoice that are marked as Taxable. To find out how to modify, created or delete a Tax Code in SuccessWare21, click HERE. In the menu on the left, there is also a Notes button. When selecting this feature the tech will be able to type in any work done and/or work suggested notes. *Caution: These will be visible on the invoice that the customer reviews, as well as the invoice emailed to the customer. The Notes display by default, but can be adjusted on the SWRemote Admin site by clicking HERE. At the bottom of the screen there is a box that reads, “Add predefined Work Done/Work Suggested notes”. 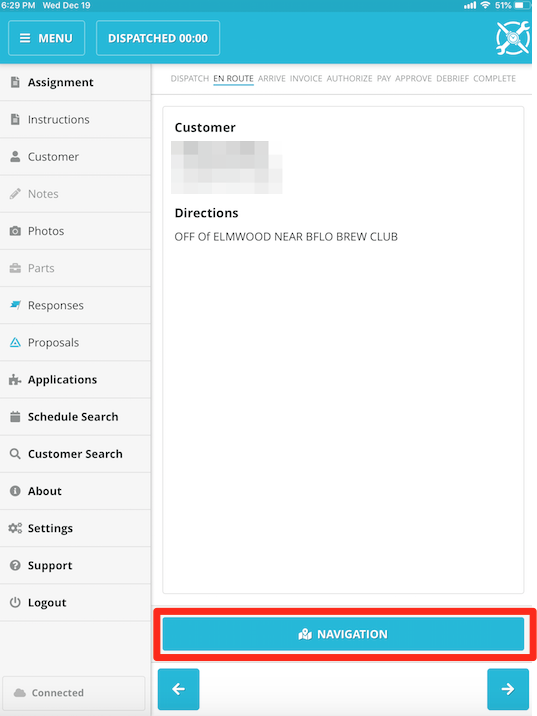 Here, the tech can choose predefined notes setup by their office staff on the SWRemote admin site. To learn how to create and modify the predefined Notes, click HERE. In the menu on the left, there is also a Photos button. When selecting this feature the tech will be able to press the Take Photo button, which will bring up the camera. Once the picture is taken, Tags can be selected and then the Photo can be saved. * The Photos button will only show up if Dropbox is integrated by the Office staff on the SWRemote admin site. For instructions on integrating Dropbox, please click HERE. 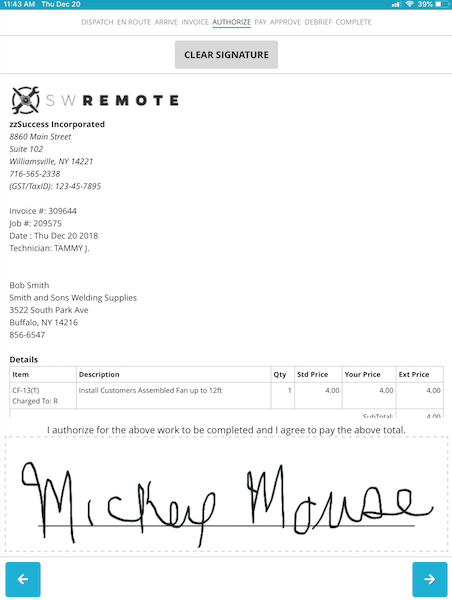 Once you have Dropbox integrated and Forms created as well as published inside manage.swremote.com, the Technician can fill out any Customized Forms. Now a new menu tab will be available to them labeled "Applications." 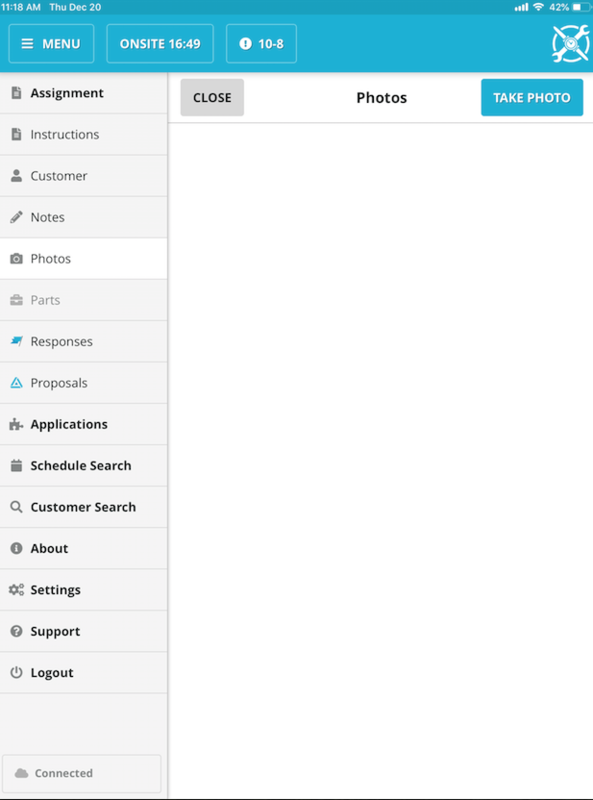 If only one Form is added, instead of Applications, the name of the Form will be displayed. *NOTE* This will not become viewable on the menu until a tech is inside an assignment. When the tech is finished filling out the form, be sure they are hitting "Save" before they "Exit" so the form will be saved. *NOTE* The tech can go back and make changes to the form after they save it while they are still inside the same assignment in SWRemote and pressing save each time. 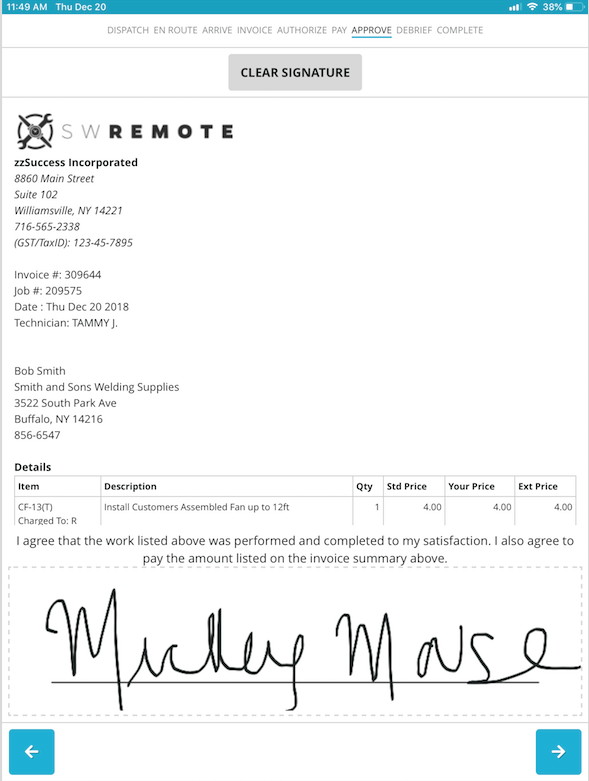 Once the invoice has been built and the Tech presses the Right Arrow, the customer will sign off on the WorkAuthorize screen. *This is on by default, but can be turned off. To find out how to modify this, please click HERE. On the payment screen the tech will be able to select the type of payment that will be collected. Payments Types include check, credit card, other, and none. The None Payment Type can be used to invoice a customer without applying any amount to the balance. This will leave whatever balance is owed inside SuccessWare21 for this job. When selecting to pay by check, the technician will record the check number and signature name that appears on the check. When selecting a credit card payment, the tech will record the card holder’s name, card type, card number, and expiration date. If using a credit card reader, no manual entry is needed. Simply plug the reader into the headphone jack, and then press the Swipe button to obtain the credit card information. The other payment option can be selected to take alternate forms of payment setup by office staff inside SuccessWare21’s Reference Library. Some of these forms of payment may require a Reference Number that can be placed in to the Reference Number text field. The Payment Method field acts as a dropdown box where payment methods such as Cash may be selected. This payment option is chosen when no there is no payment to collect at this time. Again, this can be used to invoice customers in order to leave a balance on the account for that particular customer. After submitting the payment, the Approve screen will require the customer to sign off on the payment that was received from the customer. 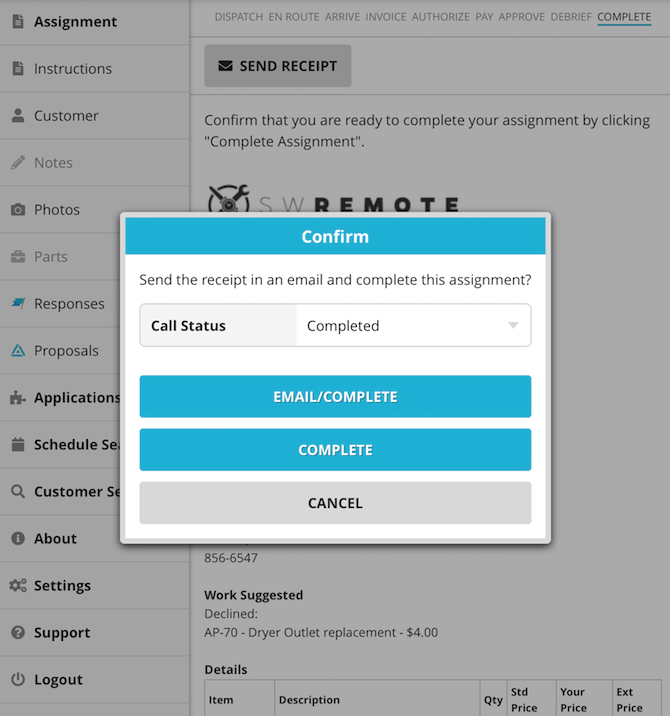 SWRemote will allow you to access the Parts button on the Pay and Debrief Job Screens. If you are on any other step inside of a call, the Parts button will be greyed out and unavailable. You will need to either move forward or backward in the call to gain access to that screen. 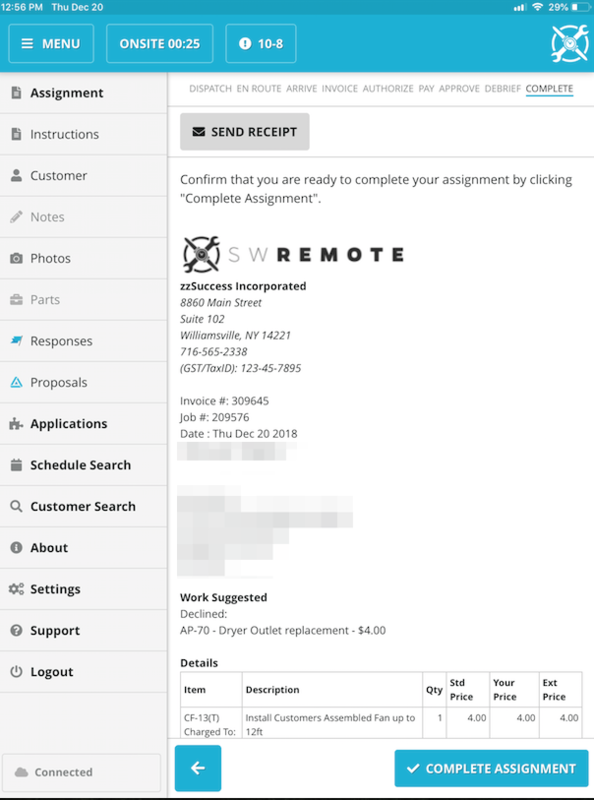 You can only add Parts to a Task or a Visit, so one of these must be added initially to the Invoice screen. 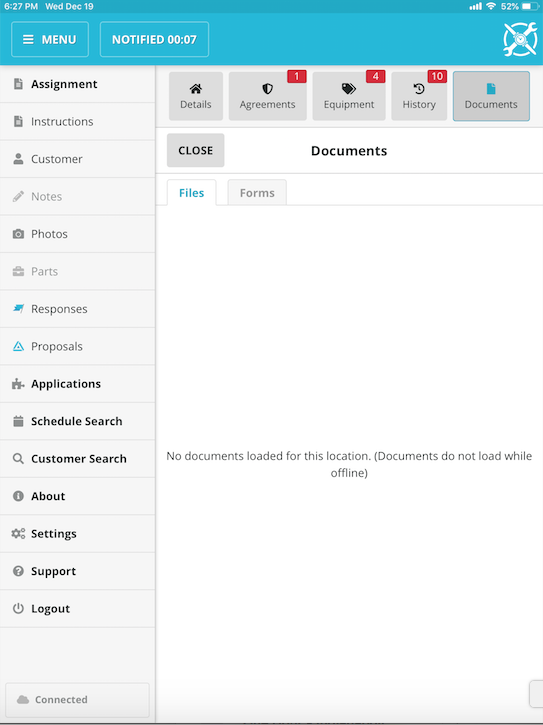 Upon Clicking the Parts button (which can ONLY be selected on the Pay and Debrief Screens, you will see the Task(s) and Visit(s) that are on your Invoice, as on the next page. Here you will be able to select Add or Scan to add additional Parts. Looking through the Catalog Or Searching by item# / UPC / Description. 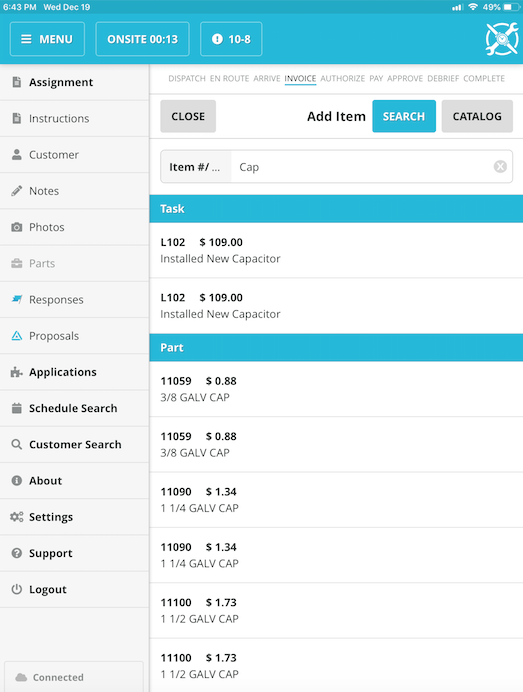 -Once you are happy with all of your Parts, press the close button and then the back button, this will return you to the Pay/Debrief screen. This screen will allow the technician to debrief their job and record opportunities, job data, and call types. 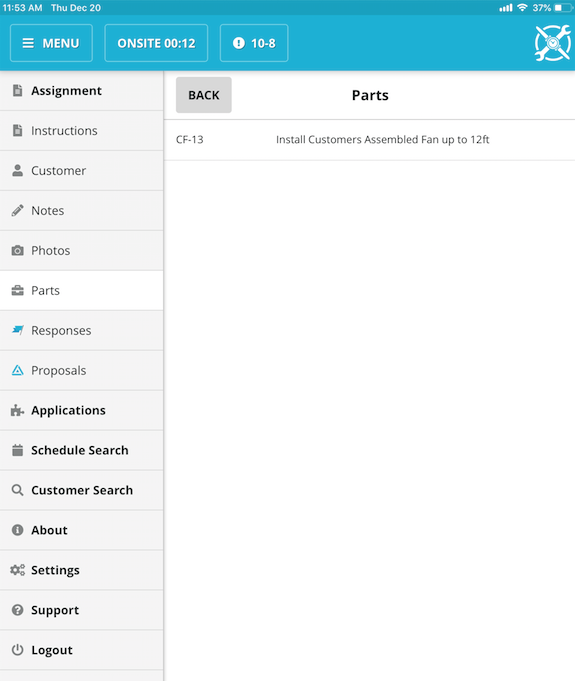 At the Complete Assignment screen, the technician will be able to review the job details, email receipts to customers, and complete the assignment. By pressing on the Send button, the tech will be able send a receipt electronically. If the customer has an email on file (located in the Location Info), this email will automatically be populated in the email field. 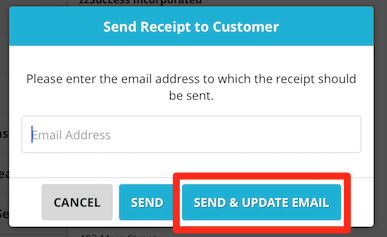 If the customer tells you that the e-mail address on file is wrong, you can plug in the new e-mail address and then press the Send and Update Email button. When pressing the Complete Assignment button, you will see the following options. Upon completing the assignment, the tech will then have the option of choosing a time card status. 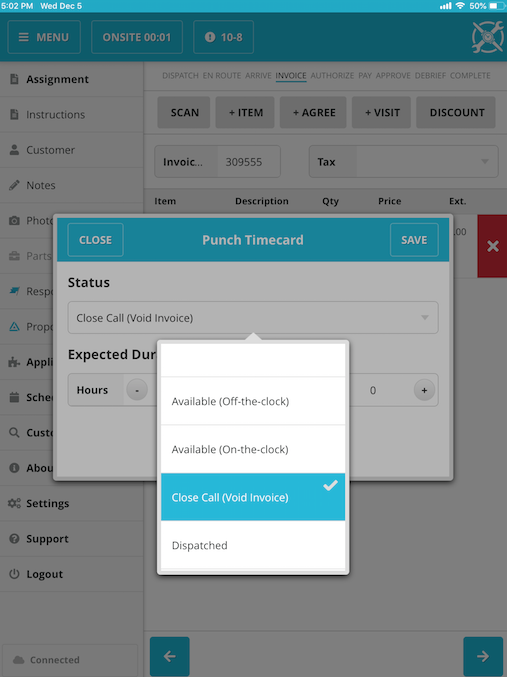 If the technician does not want to set a new timecard status, they can click the Close button. 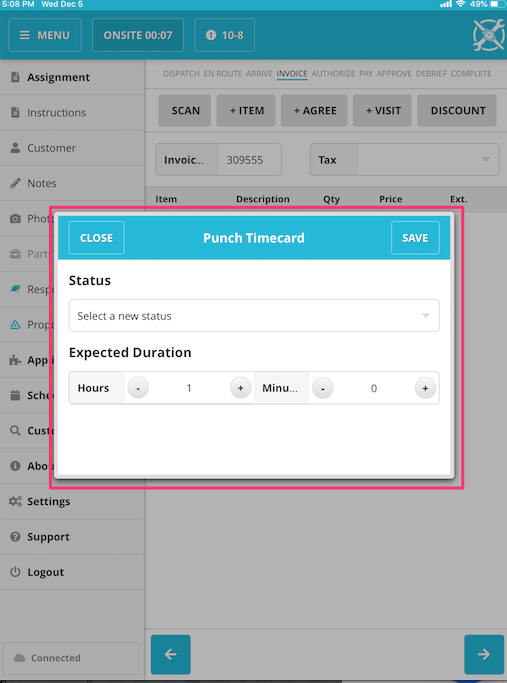 The tech will press the Status dropdown box and then select the appropriate time card option. Once they have chosen the appropriate status, and have adjusted the expected duration, the tech can press the Save button. A technician can add a job from their device if they have the specific permissions setup in SuccessWare21. The user groups of Remote Tech Manager and Remote Tech On Call have this option by default. 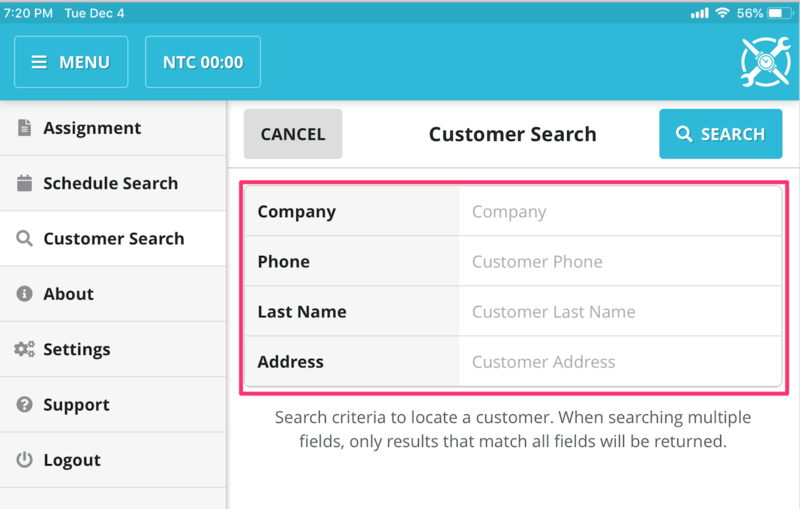 The tech will press on the Customer Search button in the side menu, and then choose a category to search by. The tech can search by company name, phone number, last name, or address. When the search is complete, the tech will be able to select the appropriate customer from the list and view the details of that particular customer’s account. At the Location Information screen, the tech will select the + button at the top far right of the screen. The technician can now enter all the necessary information needed for the job. 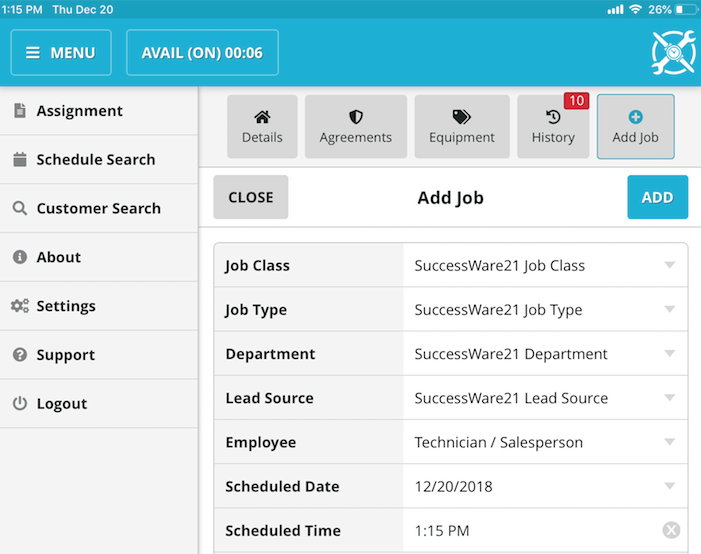 When the appropriate fields have been entered, the tech can press the blue Add Job button to add the job to their own schedule or to another technician’s schedule. 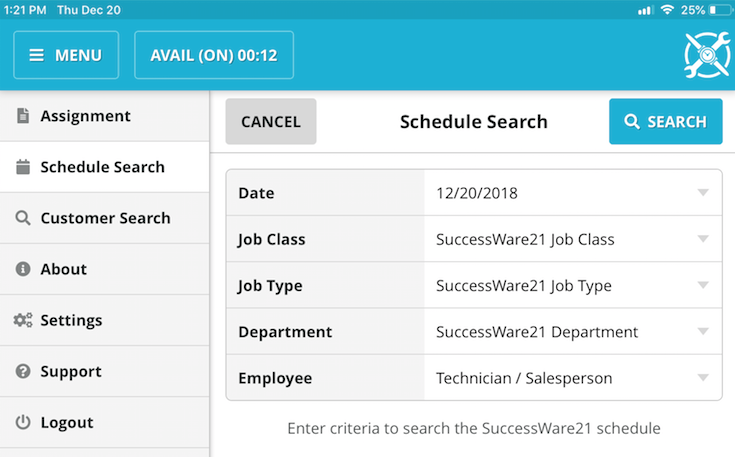 Technicians in the Remote Tech Manager user group in SuccessWare21 will have the capability to perform a schedule search. 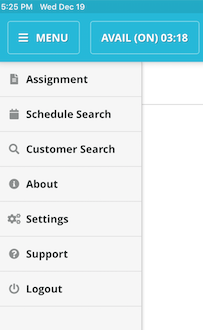 To do so, the tech will select the Schedule Search button in the side menu. The tech can search schedules by date, job class, job type, department, or employee. 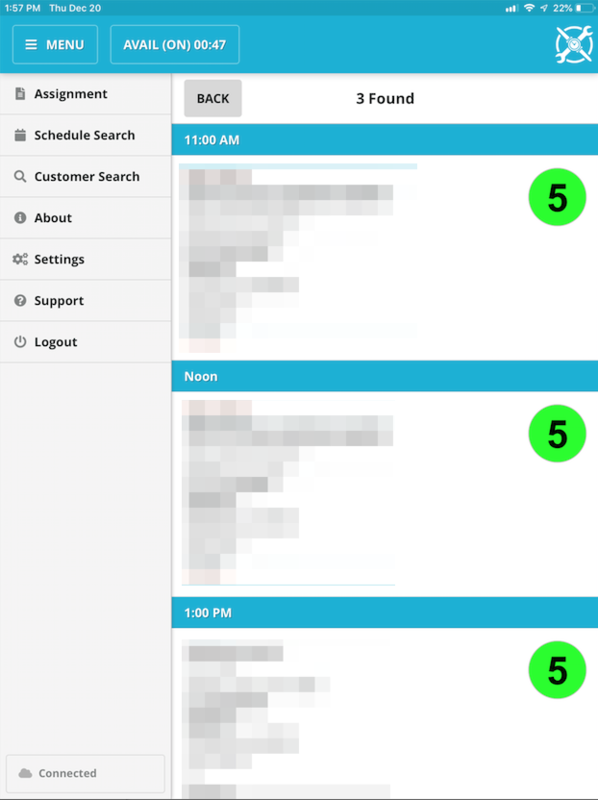 After the search has completed, the schedule screen will show all jobs that matched the search criteria. Selecting the Settings button from the menu (Left Navigation) will see several options to choose from. 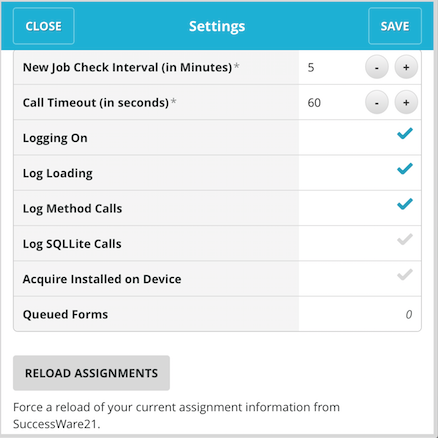 You can change how often the device will check for new jobs (while not on site) as well as how long before moving between screens can timeout. Reload Assignments If a change was made to your job(s) in the office, pushing this button will allow you to see those changes on your device. Force Resync will delete the device’s copy of the pricebook and download it again, which will fix many discrepancies that can occur between the device and office. Sync Dropbox This will sync any forms back to the Office or download any documents from the Office, which may have been added to Dropbox before you dispatched to the current job. On rotating Tuesdays and Thursdays, by appointment we have an Open Training session as well. This is a great follow up to the training above, as well as a good refresher for your techs after they've been using SWRemote for weeks or even months and years. We will walk through an entire call on SWRemote, and will be happy to answer any questions you have along the way. Come with your questions ready! If you're interested in signing up for one of these sessions, you can follow the instructions in this article here.